Home / What Are Medical Foods? Medical foods is a unique category of FDA regulated products that meet the distinctive nutritional requirements or metabolic deficiencies of a particular disease state. The distinctive nutritional needs associated with a disease reflect the total amount needed by a healthy person to support life or maintain homeostasis, adjusted for the distinctive changes in the nutritional needs of the patient as a result of the effects of the disease process on absorption, metabolism and excretion. 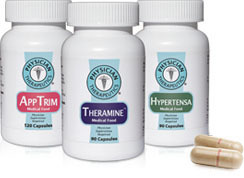 Medical foods such as Theramine® which is specifically formulated to manage the pain and inflammation of specific disease states, go beyond simple dietary interventions, and are specifically formulated to meet the distinctive nutritional requirements of a specific disease that cannot be met with a simple dietary shift. Increased nutritional requirements can be the result of inadequate ingestion of nutrients, malabsorption, impaired metabolism, loss of nutrients due to diarrhea, increased nutritional turnover rates inherent in certain disease states, or the impact of drug therapies. The nutritional requirements of an individual in a disease state can be considerably different from those of a healthy individual. Recognizing and managing these increased nutritional requirements should be an integral part of the medical management of clinical conditions. This may be accomplished through the use of an FDA-regulated therapeutic product class known as Medical Foods. Watch: Optimize Clinical Care with Medical Foods.